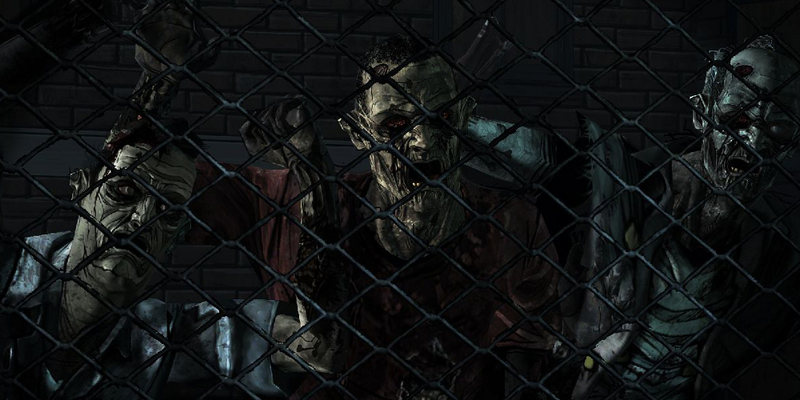 It is always with no small amount of trepidation that I start each new episode of Telltale's The Walking Dead. Which character will I let down this time? What agonizing decision will I be forced into making? Will Kenny stop going on about boats? The closing scene and strange revelation from Long Road Ahead left me with plenty of questions, and a great deal of fear over Clem's well-being. There was also the introduction of three more characters that I didn't quite trust yet. I wasn't sure what to expect from Around Every Corner, though I knew I'd feel terrible afterwards. I hate being right. Around Every Corner opens with the survivors slowly walking through the desolate streets of Savannah, all of them suitably nervous. Seeing them all together hammered home the fact that almost half of the group are pretty much strangers. Lee, Clem, and Kenny are the only original members left, though annoying schoolboy Ben was unfortunately still with us. I was pretty nervous, too. Omid's injured leg was slowing the group down, and it wasn't some quiet country town they were walking through -- it was a city. Everyone knows that you don't go into the cities. That's where the boats are, however, and where Clem hopes to find her estranged parents. Previously, Kenny's insistence on finding a boat had seemed silly, and often rather annoying, but as I looked at his sallow, colorless face, and heard the lethargy in his voice, I couldn't bring myself to be angry with him. My Lee's relationship with the redneck boat mechanic has been a difficult one. When I saved his son, Duck, in A New Day it started a friendship that would be left in tatters a mere one episode later. Since then it's been like walking on eggshells. No, walking on glass. Yet the pair are now forever connected through a terrible tragedy, perhaps the worst in the series thus far, as we are quickly reminded in a truly disturbing way. The Walking Dead had done a great job of making me feel connected to the group, but with the introduction of several new characters last episode, and the loss of many older members, I didn't really feel like this way my group anymore. Unfortunately, Around Every Corner does absolutely nothing to change this. Omid and Chuck are barely featured, and Christa's contributions amount to worrying about Omid, in addition to unsubtly revealing a twist that never really gets dealt with. Instead, we are introduced to several new characters, none of which stick around for long. These new characters are all connected to a little totalitarian state set up in the middle of the city, and while interesting and well written, their inclusion felt a little forced. Worst of all, the focus on them was at the expense of older, yet not particularly established characters. I know one more thing about Christa; that's all I learned about the newcomers from A Long Road Ahead. The mysterious man on the radio takes a backseat to fixing up a boat Kenny and Lee find at the docks, and exploring the post-apocalyptic city of Savannah. It's a massive tonal shift, both welcome and unwelcome. The city itself is filled with with boarded-up windows, stripped vehicles, and shocking scenes. It's a foul, dilapidated place, in stark contrast to the rural setting we've become used to. Standing around in the streets was nerve-wracking -- I've never felt so vulnerable. There are, of course, zombies everywhere. On the streets, in buildings, and even in the sewers -- they wander around aimlessly until they find their next meal. The balance between the threat of zombies and the threat of other people has been perfect up until now, but it all unravels in the city. Lee slaughters countless shambling corpses, often with his magical gun that never runs out of bullets or requires reloading. These aren't tense moments where Lee is fighting for his life; more often than not, he's dispatching them as if they were no problem whatsoever. In earlier episodes, the action sequences often came out of nowhere and caused my palms to sweat like nobody's business, but that's not the case in the latest installment. Increasing the action only serves to remind players that this isn't an action game, and the engine isn't really designed for it. Ultimately, however, the threat of the zombies is fully realized by the end of the episode, and it sets up the most difficult decision I've had to make in the series thus far. It left me broken, and reminded me why I've become so invested. Juxtaposed to this are moments of investigation, light puzzles, and caution. It surprised me that the most action-packed episode also contained the most typically adventure game moments. From exploring a big creepy house, to scrambling about in the sewers, Lee gets through quite a bit of the city. The puzzles are simple, fairly common sense obstacles -- inoffensive, but not memorable. 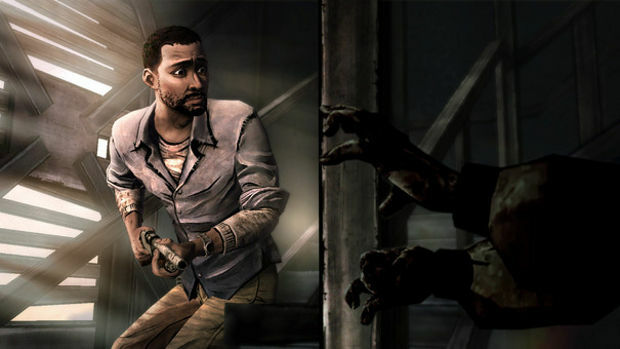 In the sewers, Lee uses his wits to avoid a confrontation with some zombies, which was a nice touch given that he spends much of the game shooting them. In the rush to build up to the finale, Telltale tries to fit a huge amount into a two- to three-hour experience -- sadly, I don't think it works. Splitting Around Every Corner into two games would have allowed for longer periods between action, more interactions among the new characters, and more time spent with those introduced in the last episode. It sets up a whole narrative arc reminiscent of the Governor arc in the comics, but there's absolutely no payoff. I like a game that plays with our expectations, but such things always run the risk of ending in disappointment, and that's almost certainly the case here. Despite the many missteps, it was still a gripping journey. 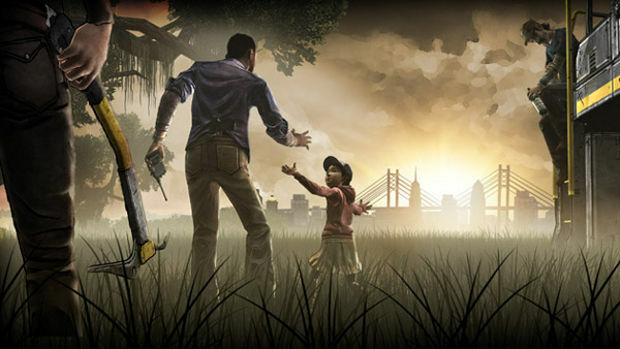 Lee, Clem, and Kenny remain fantastic characters, and seeing them develop has been a tragic, but compelling experience. 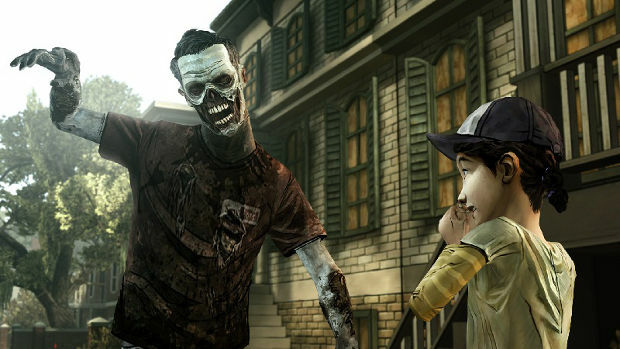 The relationship between Lee and Clem has been a highlight throughout, even more so this time around. There is one scene in particular where Lee is given an opportunity to give up Clem as his ward, and damn was I seething; I didn't even have to think about a response. For a moment, a terrifying side of Lee appears, one where he will do anything -- and kill anyone -- just to keep the little girl safe. It was both gratifying and unnerving. I expect that Around Every Corner will be the most divisive episode in the series. It stands apart from that which has come before, and I have no doubt that the change will be appreciated by some players. 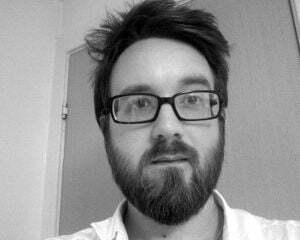 It was penned by Gary Whitta (The Book of Eli), which may explain why it seems to different. As the penultimate episode, I found it somewhat underwhelming until the last 15 minutes, but I think that if the whole series was played as one game then it would work a lot better. Experiencing it straight after the third episode would likely make it feel less jarring, and the increased level of action could be seen as a nice break from all the long discussions and arguments. Rushed and awkwardly filled with new, unexplored characters as it is, it still does its job well by building things up for what will surely be a gut-wrenching, soul-destroying conclusion to what is the strongest episodic adventure I've ever played. 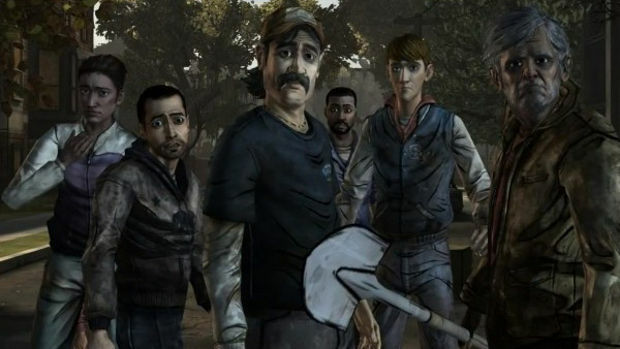 Around Every Corner is a victim of the previous episodes' success, and much of the disappointment comes from the fact that I know Telltale is better than this. It's exciting, and damn is it important, but it's still the weakest of the bunch.